China, the world's second largest national economy, is losing momentum. The International Monetary Fund expects that the country will experience a decline in its growth rate from 10% to 6% in the next few years. One reason for the economic setback could be the trade conflict China is having with the US. However, demographic change and high debt are also negatively impacting China's economy. This development also indirectly affects the Swiss economy. Last year, 5% of Swiss exports went to China. That's not much when compared to Germany, where the export volume to China was four times greater. Still, some Swiss industries are heavily dependent on China's economy. It's not just China's economy. Global growth is also declining. The Swiss economy will be affected. Learn about the effects on the Swiss economy, exports, and monetary policy in Credit Suisse's Monitor Switzerland. Export elasticity can be used to demonstrate the effects of a sharp decline in China's growth on Swiss exports. Under the assumption of a constant exchange rate, export elasticity shows by how many percentage points the export growth in Switzerland would increase or decrease if the growth of China's gross domestic product (GDP) changes by one percentage point. 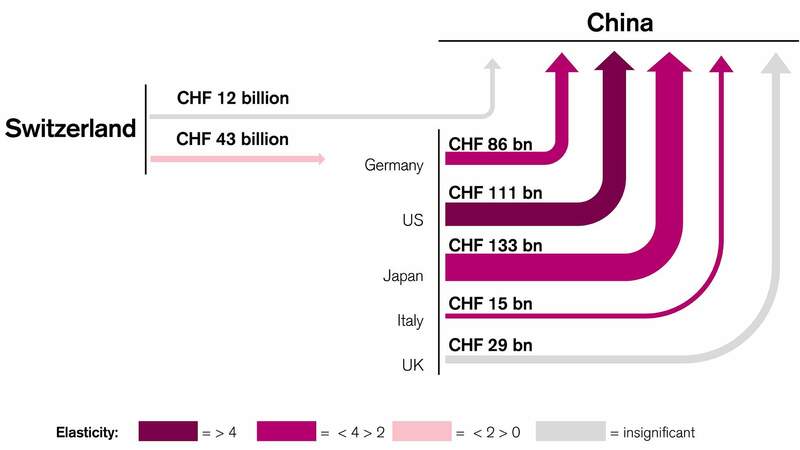 The elasticity between Switzerland and China is not statistically significant. 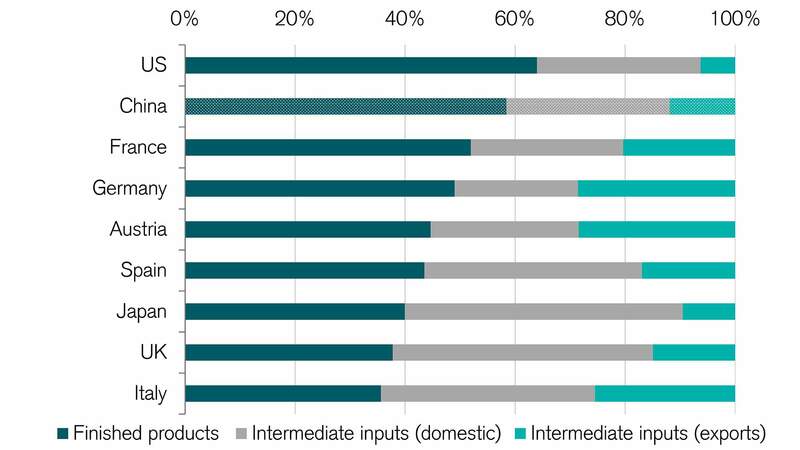 However, when you look at individual industries, you see that, at 2.6 percentage points, the food industry in particular is very dependent on China's economic situation. The watch and machinery industries are also especially sensitive to changes in the Chinese economy. GDP/export elasticity between Switzerland and China by industry (1999-2018). The sensitivity of the global economy to changes in the Chinese internal market will once again increase thanks to Beijing's new government program. That's because China is changing from an export-driven economy to a consumer-oriented one. This promises increased imports, but at the same time, the increased inflow of goods means that China's trading partners will become more dependent on the country's economic situation. For example, the Swiss pharmaceutical industry, which is currently not very sensitive to economic conditions, will, in the future, be affected by the growth slowdown in China. The composition of Swiss exports also provides information as to the extent of Switzerland's reliance. Switzerland exports mainly finished products, so the Swiss economy is particularly dependent on Chinese final demand. Should China's GDP growth decline, a drop in demand could follow. Switzerland's export growth is slightly lower when compared to the record year of 2018. Swiss SMEs are nonetheless optimistic. 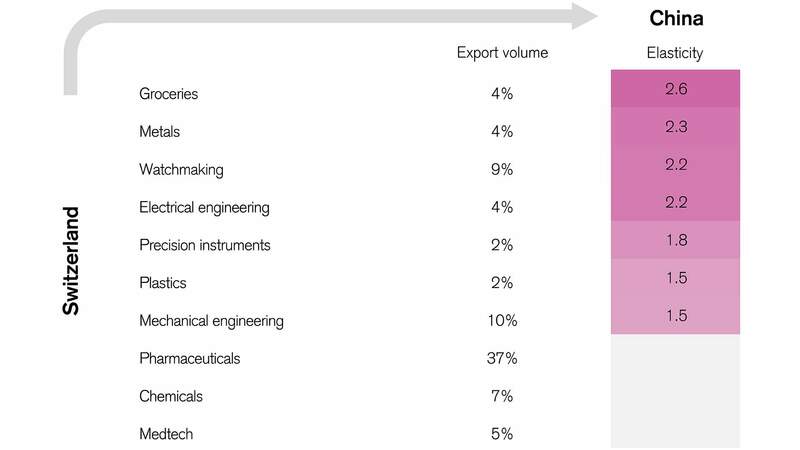 Value creation of Swiss industrial exports in 2014 according to use. However, China's significance cannot be derived simply from direct trading statistics. One example of this is the watch industry: While China imports relatively few watches, Chinese people often buy Swiss watches while abroad. Therefore, sales in the watch industry depend primarily on Chinese travel patterns and less on Chinese demand. Swiss exports to Germany are also influenced by China's economic development, as 20% of exports to Germany are processed there and then exported to China, among other countries. One prominent example of this is the automotive industry. The Chinese market is becoming more and more important for Swiss SMEs. However, if you want to export to China, you should know the cultural differences and regulatory barriers. We can forecast just how far-reaching the consequences of an economic downturn would be using two different scenarios. On the one hand, China's growth could slow due to internal factors. These would include the high levels of debt and demographic change. If this were the case, the impact would only be felt in specific industries, namely those that either conduct direct trade with China or that react strongly to changes in purchasing power. On the other hand, external events could trigger a decline in growth. An escalating trade conflict would have serious consequences for the Swiss economy, because even industries that are not directly related to China would be hit with falling demand due to setbacks in the global financial markets. Learn more about the Swiss export economy. Download Monitor Switzerland 2019 This link target opens in a new window Do you have any questions about exporting to China?